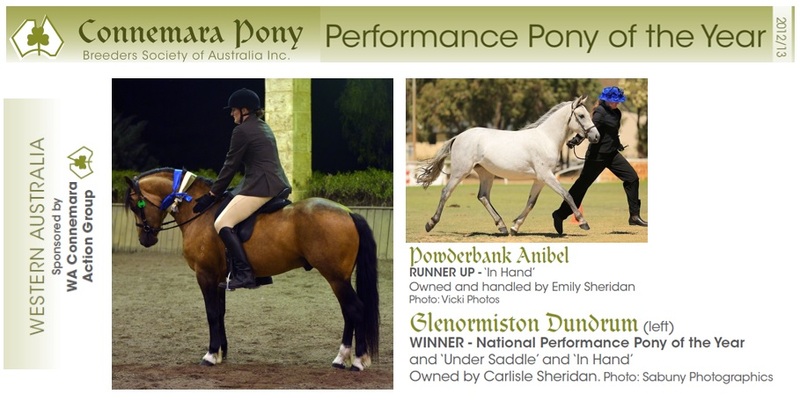 Glenormiston Dundrum does it again: National Performance Pony of the Year! We are thrilled to announce that one of our resident stallions, Glenormiston Dundrum, has taken out the CPBSA’s National Performance Pony of the Year title for the 2nd time in a row! Dundrum won the WA State Titles for both in-hand and under saddle, and we are also pleased to announce that his daughter, 2yo Powderbark Anibel, received the WA runner-up title for in-hand and also achieved her bronze medallion for performance. Below is an excerpt from the announcement of the awards that was published in the September edition of Horse Deals magazine.